Last week’s poll was really interesting. Again it was a nail biter. A close race between an Asian dish or a Mexican dish with the later winning out by just one vote. What’s funny is that the two dishes that I was least comfortable with were the top dishes. But that’s what this site is all about. I had never made chile rellenos before and honestly I was a bit scared. I mean, peppers are tender guys, especially after they have been roasted. And i just couldn’t imagine stuffing them with cheese and having that work. Turns out I had nothing really to worry about with these chile rellenos. They turned out awesome. 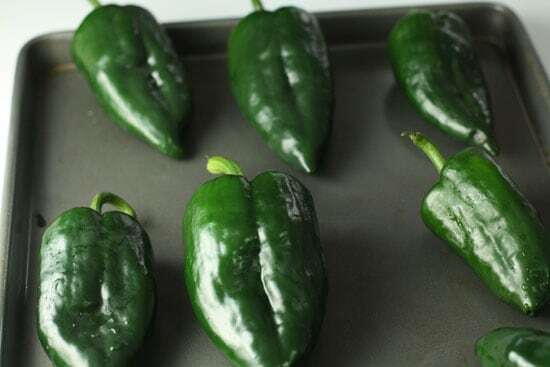 You can use a lot of different peppers when making chile rellenos. 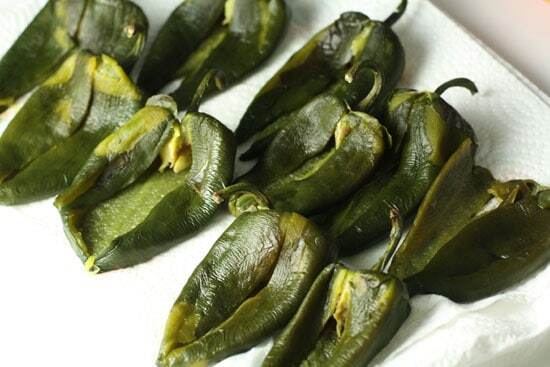 The classic is the Hatch Green Chile, but you can use any large medium-spiced pepper. I chose poblanos just because I’m pretty familiar with them and they are large enough to fill and easy to find. 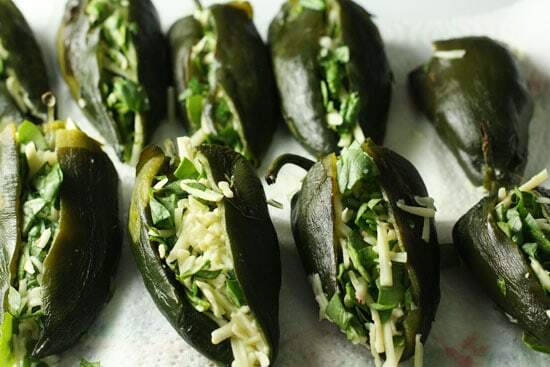 Chile rellenos with poblano peppers, spinach, and cheese. 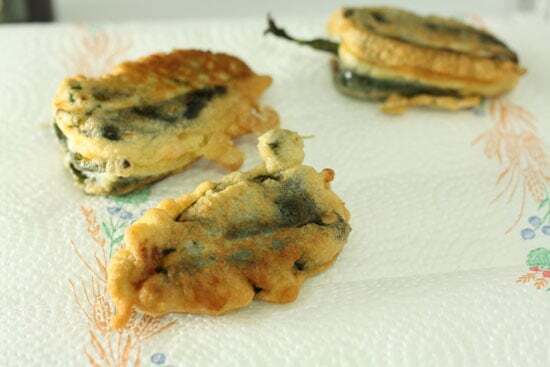 I lightly fry the rellenos with a beer batter. 1 28 ounce can tomatoes. I used crushed and just strained out the liquid. 1) Pile the peppers onto a sheet pan and roast them at about 450 degrees for 25-35 minutes. Be sure to keep an eye on them and turn them every few minutes to ensure even charring. 2) Mix all of the salsa ingredients in a bowl while the peppers roast. 3) When the peppers are done roasting, cover them with plastic wrap or wrap them in a paper bag for 10 minutes to let them steam. 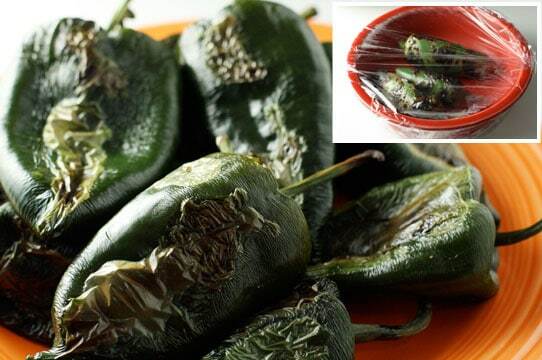 4) Clean the peppers: Run the pepper under cold water and peel off the skin. Make a small slit down one side of the pepper. Using your fingers, reach in and pull out all the seeds and extra pepper guts. 5) Grate the cheese and mix it in with the spinach. 6) Using your fingers, gently fill each pepper with the filling. You can stuff them pretty full, but make sure that you can close the pepper so the two open sides can touch. 7) Mix the egg yolks, salt, flour, and beer in a bowl. 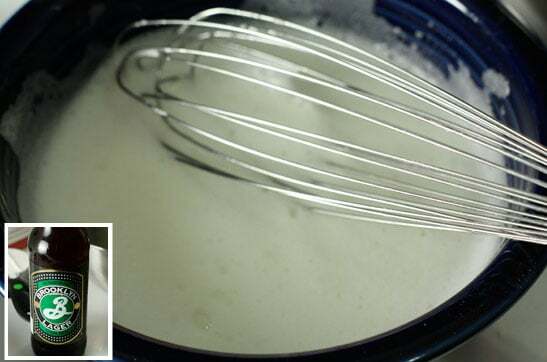 8) In a separate bowl, whisk the egg whites until they have medium stiff peaks and then slowly fold the egg whites into the beer flour mixture. Try to keep as many of the bubbles as possible. 9) Using your favorite skillet, heat up about 1 cup of vegetable or canola oil. You want about 1/3 inch or so of oil in the pan. Get it hot and then lay in each pepper seam side down after you dip it in the batter. You can test that the oil is hot by flicking in a bit of the batter and seeing if it fries. 10) Fry in hot oil for about 4 minutes a side. Then scoop them out with a spatula onto a paper towel to cool and drain. 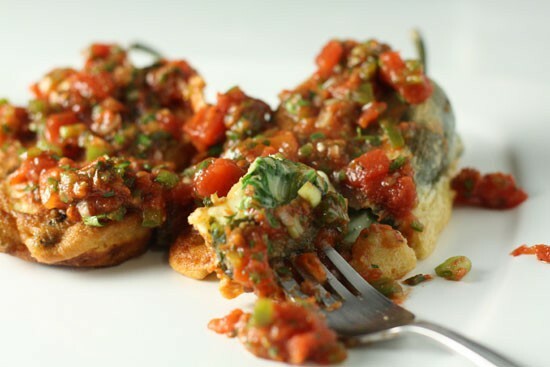 11) Top with a good helping of the salsa and enjoy! Step one in this recipe, before we even get to the recipe, is to roast the peppers. I would assume about two or three peppers per person and just pile the peppers onto a sheet pan and roast them at about 450 degrees for 25-35 minutes. Be sure to keep an eye on them and turn them every few minutes to ensure even charring. If I’m just roasting a few peppers, then I would roast them on my stove top like I did in this recipe. But for large jobs, the oven is faster. Ready for the roaster boys? The chile rellenos are good but they really need some sort of salsa or sauce to top them off. There are a lot of options for this. You could use an enchilada sauce. You could make this awesome roasted pepper salsa. Or if you are tight on time you could just make a quick 10 minute salsa. Basically, just mix all of these things up in a bowl while your peppers roast. Fast and delicious. Not the best salsa I’ve ever had, but it’s plenty good. 10 minute salsa is pretty solid. When your peppers are done roasting, cover them with plastic wrap or wrap them in a paper bag for 10 minutes to let them steam. This will make them really easy to peel. Notice the time travel. The below photo has my roasted jalepenos. But they are being chopped in the above photo. The Internet allows for things like that to happen. Sorry. Lots of roasting happening here. 1) Run the pepper under cold water and peel off the skin. 2) make a small slit down one side of the pepper. 3) Using your fingers (they are the best tools here), reach in and pull out all the seeds and extra pepper guts. Try to keep the stems on if you can as they will make for easier dipping later. As you can see though (bottom right) I lost a stem on one or two and they still worked out okay. I messed up a few of these. No worries. Filling the peppers is pretty easy. Grate your cheese and mix it in with your spinach. Then, using your fingers yet again, gently fill each pepper with the filling. You can stuff them pretty full, but make sure that you can close the pepper so the two open sides can touch. These look open, but I squished them closed before I dipped them in the beer batter. Mix your egg yolks, salt, flour, and beer in a bowl. In a separate bowl, whisk your egg whites until they have medium stiff peaks and then slowly fold your egg whites into your beer flour mixture. Try to keep as many of the bubbles as possible. You should end up with a pretty light batter. Can’t go wrong with Brooklyn. Using your favorite skillet, heat up about 1/2 cup of vegetable or canola oil. You want about 1/3 inch or so of oil in the pan. Get it hot and then lay in each pepper after you dip it in the batter. You can test that the oil is hot by flicking in a bit of the batter and seeing if it fries. Remember to lay the pepper with the seam side down. That will seal the whole thing closed. These should fry in hot oil for about 4 minutes a side. Then scoop them out with a spatula onto a paper towel to cool and drain. Top these bad boys with a good helping of the salsa and you are all set! This was a tasty bite. I was really worried about this recipe. I thought a lot could go wrong but in reality, it was a pretty forgiving recipe. I messed up a few peppers, but they still filled okay and fried just fine. I was also worried about the cheese not being melted when the pepper was fried perfectly, but that wasn’t a problem at all. These guys may have been a bit of work, but they were really good. Give them a shot if you are looking for something a bit challenging. And awesome. These looks absolutely incredible! My husband would be so excited if I made these for him. I just passed on the Kreativ Blogger award to you and your fabulous blog. Please check out my site for details on the award. What always put me off making these was the difficulty I've had in getting every last bit of skin off the peppers. But I see that you *didn't* get every last bit, and you say that it was good enough? They certainly look good. Haha. Yea. There is so much going on with the final dish that you won't notice a bit of pepper skin. If I worried about that I would still be peeling the darn things. Nick, I'm making theese tonight!!! I thought some black beans in the filling would add a great flavor? Mmmm my mouth is watering already, thanks for the great post! Wow! Thanks for thinking of me! Ooooh, that looks good! I like any recipe that says to drink the leftover beer. Do you think grated zucchini would work in place of the spinach? Pretty soon mine will be getting ripe . . .
What a wonderful dish. I wonder how good these would be as a canape? I am going to have to give it a try for the new canape menu. What do you think Nick, would jalapenos be too boring, or is there another bite-sized pepper? @Jean… definitely. Just make sure you pat the zucc with a paper towel to get out some of the moisture. Otherwise your filling will be watery. @Jason I don’t think there is anything boring at all about jalepenos! and how funny, I actually made poblano chiles relleno too (mine are pork though) – I just haven't gotten around to posting them yet. smart monkeys use tools!….kitchen tools are wonderful. a simple creme brulee butane torch can be used for this…it only takes about 30 seconds…. think of the gas or electric cost of heating up the oven and keeping it going for roasting chile or tomato skins to peel..two or three roasting adventures in a month and you have PAID for a nice little torch. also, without the long oven roasting, you dont have to worry as much about stems coming off, as the meat of the chile is not cooked to a soft state. this aids in cleaning, peeling and stuffing too, as the chile meat is left more sturdy. just let it spend 40 more seconds in the frying oil if you like your chile mushy. these little torches have many creative kitchen uses…as well as crisping up the top of creme brulee, meringue browning for baked alaska (torched alaska), heating your favorite liquor or, in a pinch,lighting your crack pipe. i have always made chile rellenos with "ranchero" sauce, but, now that you mention it, with a couple of tblspns of "jacks special" medium salsa….just writing about it makes my mouth water. ranchero sauce is warm to hot, because its cooked… the heat of the sauce on top adds to the flavor dispersion in your mouth. salsa should probably be room temp. so as not to be cold and counteract all that flavor from that wonderful heating and cooking you did. 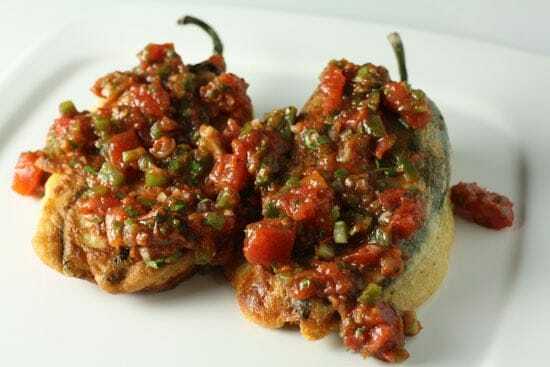 oh.. and you dont have to call it "Poblano" chiles relleno… were it made with any OTHER kind of peppers, then you should mention that in the name, but not poblano peppers, as poblano are customarily the peppers used. ive actually used a small hand held propane torch from a hardware store too. cheap, easy to get, hold more fuel. restaurants use these. I don't think I've ever seen poblano peppers here though. It's hard enough trying to get serrano peppers. This looks like one of those recipes I'll daydream about. Or drive me to head down to Mexico my next holiday. OK, I made these tonight. I got a great deal on poblanos at the farmer's market last Saturday and they had to be dealt with. Regarding the salsa, I couldn't find serranos today, so I bought two hot finger chile peppers and roasted them. I only put in one roasted jalapeno and it gave plenty of kick. 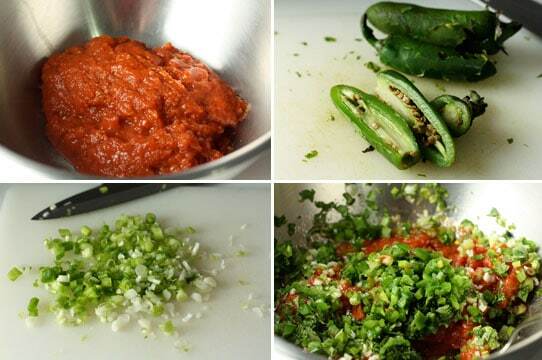 Nice fresh, easy salsa. Thanks. 25 minutes at 450 degrees left my peppers blistered but with no body. I'll try shorter baking time next time. The only batter I had was a fish batter, but the flavor was somewhat mild and didn't ruin all this hard work. I was most thrilled with the flavor the spinach brought to the dish. I would make this again. I will DEF make the salsa again. I might marry that salsa, you know, unless a better offer comes along. I'm just saying. My ElPaso-born-and-raised-Gal made these for us last night and she thought they were the best she ever had and I agreed. They were made fabulous by the beer batter and spinach filling but we didn't try your salsa, next time maybe. Thanks for a great receipe. I had a heck of a time finding a decent looking recipe for Chile Rellenos on the web, then finally came across this recipe. I love the step-by-step instructions along with the pictures; that really helps. After all was said and done, these were really good. I think I am going to play around with the filling next time, and I may make green chili to put on top, but other than that, this recipe is a keeper. I love the batter. It’s so easy to make and when fried up, it makes a very nice, light, crispy coating around the peppers. Great work on this …. especially the spinach part. I made this healthier without the batter, but with the peel. Slice the Pablano pepper in half, fill with heated mixture of refried beans, chopped leftover roast beef, sauted onions and tomatoes, celantro, lime juice, chili powder, garlic, seasoned salt, and hot sauce. Cover with salsa. Bake at 375 for 20 minutes. sprinkle with grated cheese and crushed tortilla chips and bake for 10 min. more. 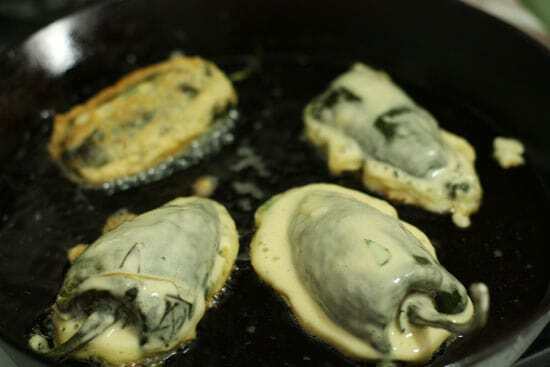 serve with rice or beans, and sour cream with chopped celantro. I’m not sure if this is traditional, but I use recipies as a starting point of creativity and not as a book of rules. Go create ! I just made these for dinner today, and they turned out wonderfully. Thanks for the very easy to follow recipe and useful tips. I would definitely make these again. Can't wait to try these. The ones I've had in restaurants have been made with a heavy corm meal batted. These look lite, won't drown the flavors. Larry, great idea, will try that also. Thanks! Two things you can do to make your chilis easier to dip into the batter. One is instead of shredding your cheese, cut a wedge shape and jam it in there, and then just fit the rest of your filling around it. The second thing is to use a toothpick to hold the chili closed, and the wedge of cheese will give you something solid to drive it through. That way, you just dip it by the stem, without worrying about it falling apart. I've made these twice, both times without the crispy coating. I put the chiles (after I baked them) in a corn tortilla with roast potatoes and a healthy dollop of homemade salsa roja, mmm, so good. Thanks for the recipe, it's fab. I don't know how this batter can be workable. Mixing 1 1/2 cups flour, 4 egg yolks, and 1/2 cup beer turns into a big pile of glop. If you want it thinner, just add a bit more beer and it'll thin out. Too thin though and it won't stick to the poblanos. Also, yea… batter is just thin Glop. So if yours is too gloppy, just add more beer. Should do the trick. Made this tonight and it was really good. Like any chile relleno recipe, dealing with the peppers is a bit of a pain but the end result was delish! I roasted my peppers under the broiler which worked quite well and I cooked the spinach with a little garlic and onion before adding to the cheese. Some of my peppers split so I held them together with a toothpick — just remind your eaters to look out for toothpicks. I thought the batter tasted delicious — I used Fat Tire beer. Will definitely make this again and work on my technique. Thanks for posting the recipe. ohohohoh! Fat Tire….I miss you Boulder! outstanding recipe. made a few changes due to lack of certain ingredients. used 2 fish peppers chopped and roasted big chiles instead of the serrano & jalapeno. also used some avery pale ale for my beer batter. excellent! again, great recipe and thanks for sharing! I plan on making these for a girls night but want to prepare them ahead of time. Will this recipe work well for a make ahead meal? Should I complete the meal and then heat them up and add the salsa prior to serving? I would say you could prep the peppers and stuff them, but fried stuff like this usually doesn't reheat all that great. It's best right away. I would roast the peppers, fill them, and then just batter and fry them right before dinner time. Good luck! Oh my freaking gorsh! My dad and I found your recipe and just said “hey these look good, let’s make them!” turns out that not only did they look amazing they were some of the best chilie relleno’s I have ever had in my whole entire life! Thank you so much for posting the recipe. They were completely and utterly delicious. Folk with sensitive skin will appreciate wearing kitchen gloves while working with the chilies. I made a ‘quick’ adaptation of your recipe to make 2 chiles rellenos for my breakfast this morning. I already had lightly blanched spinach squeezed dry and peeled poblanos in my fridge (doesn’t everybody? : ) ) I used a half cup of the spinach and 2 oz of cheese to fill 2 chiles but then just floured and sauteed them like you might a trout. For my “salsa”I heated a can of mild Rotel in the same pan after taking out the chiles. Next time I might add soft scrambled egg to the filling! or 8. It was alright, but had to use tongs to turn them. Then, looking at the small burner on the side of the bbq I thought I’d give it a try. them. Does a great job, easly to get all the surfaces, and doesn’t take long. One of our favorites and they’ll keep for a few days. Love them for brunch. Yum! I may try these for my vegetarian cousin that is visiting from NY tomorrow night. I live in Las Cruces, New Mexico, and I’m sure Hatch green chile will be fabulous in this recipe. I also like that you added the spinach as they provide an added nutritional boost.